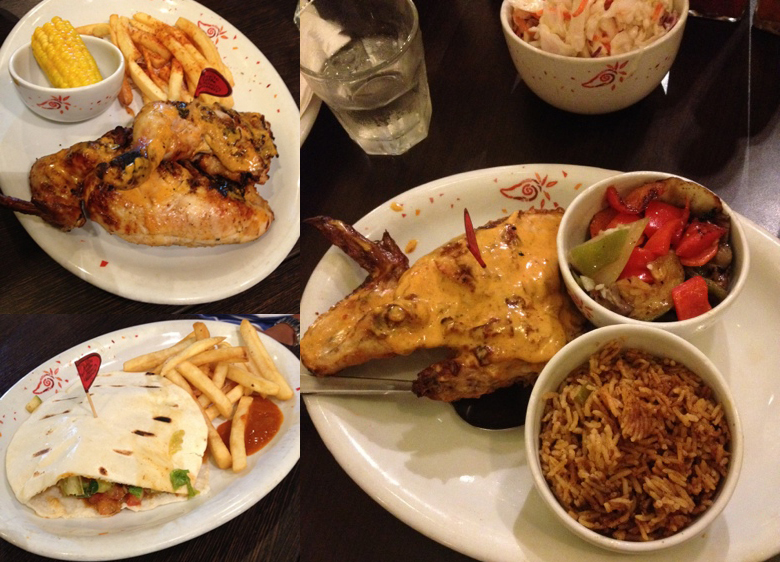 At Nando’s, it is all about chicken and their Peri-Peri sauce. Choose what you want to eat with the chicken and decide how spicy you want the chicken to be. It is something like buffalo wings, but portuguese style! 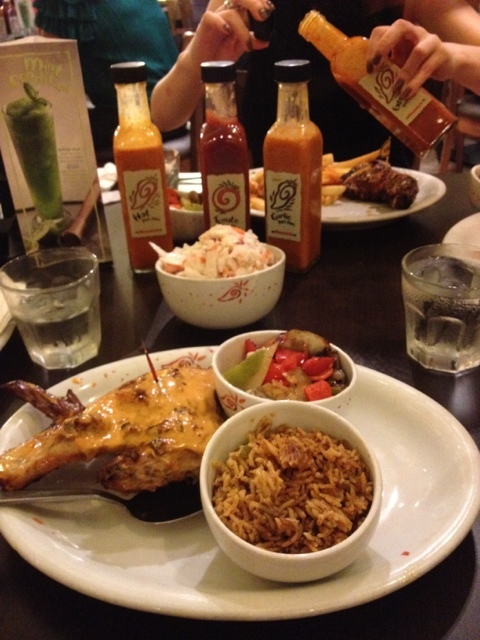 Peri-Peri, the Swahili name for Bird’s Eye chili, comes in four flavours: extra hot, hot, medium and garlic. More tangy than spicy, chilli-padi-friendly folks should have no problem with the extra hot Peri-Peri sauce from Johannesburg. The flame-grilled quarter chicken (S$14.90) was mainly breast meat but it was tender and moist. I always have a difficult time choosing my sides because I like the grilled vegetables and colesaw which are definitely healthier than the yummy Peri Chips that are like the super crispy version of Botak Jone’s slightly spicy fries. And then there’s also the carb-heavy spice rice that goes well with the chicken too. If you really like their Peri-Peri Chili Sauces like one of our colleagues who requested for 3 bottles of it for Secret Santa last year, you can purchase them at the Nando’s outlet. Their Peri-Peri sauces are 100% Natural, Kosher, Parev, Halal, contain no MSG, GMO, Artifical Colors or Flavor. This entry was posted in Food, Fun, Weekend belly treats and tagged chicken, food, singapore, spice, yummy by lifestartsonfriday. Bookmark the permalink.